Poor little calf. Poor mama heifer. Pregnant mama got a brucella vaccine, and what do you know? The baby was stillborn, having been delivered by c-section and found, upon necropsy, to have suffered fetal pneumonitis caused by infection with the vaccine strain of brucella. Poor little calf. Poor, poor cows. One baby dead from a vaccine given to the pregnant mother, and the mother dead because, well, she was just too torn up and too sick from vaccine-strain brucellosis to bother with. It was an attenuated strain, too. Amazing! How could an attenuated vaccine strain wreak such havoc, causing devastating illness and death from fully virulent brucella abortus? Recap: Pregnant cow gets vaccine. Unborn calf gets the disease that the vaccine was supposed to prevent. Calf is stillborn; heifer is euthanized. Everyone involved in the surgery is treated with antibiotics for fear they also will contract the disease. Says the CDC. Are they killing vaccine-injured people in California yet? I can hear the vaccine rah-rah crowd saying, oh, but that’s in COWS. That couldn’t possibly happen with people. People are not cows. No, we’re not. We were blessed with thumbs and bipedalism and intellect. We have the ability to question whether our government, in its perpetual morning-after euphoria of incestuous Pharma-boinking, really has our best interests—our health—at heart. Which is the worst, stupidest thing our government could possibly have done. Thimerosal was put in vaccines to prevent fungal growth in the vial. Fungal contamination leads to immunosuppression, which results in the reactivation or activation of the very viruses the vaccines are intended to prevent. Many of these viruses are known to be neurotropic and to interfere with neurodevelopment. It is glaringly obvious that this is the reason for the autism epidemic, and probably SIDS, ADHD and childhood cancers. The CDC certainly knows that this vaccine-induced brain damage is going on. They most certainly are aware of this mechanism, since it is proven by their own data. In this report, we lay out the CDC’s and other data, to explain this “common mechanism” of fungal immunosuppression that is the main driver of autism, Lyme disease, CFS and other neuro-disabling diseases. The CDC’s incrimination by self-contradiction is a pattern that cannot be ignored. Take for example the handling of Lyme disease, one of the “common mechanism” diseases. Barbara J. Johnson is a CDC officer and she owns 5 patents with SmithKline in Europe that show that there are 2 kinds of Lyme: The one they are trying to sell that has no symptoms besides HLA-linked arthritis, and the one they are trying to bury, the “New Great Imitator“/Detonator, Stealth Disabler that the Occam’s Razor shows is more of an AIDS-like disease and the NIH agrees and talks about it. Barbara Johnson also was responsible for the Dearborn conference where they threw out these neurological, New Great Imitator, AIDS-like outcomes. You can look at data from the 1960’s and 70’s, on congenital rubella causing autism, to understand that vaccine-strain rubella injected into an immune-compromised child, or along with a fungal contaminant in the vial (causing immunosuppression), would cause autism. In fact, that’s why they came out with rubella vaccines in the first place. Way to let your cannon backfire, CDC. And without any evidence to support their assertions that vaccines are safe, our Pharmocracy merely needs to say they are safe, and they are deemed so. Should we hand over the U.S.’s naming rights to Pharma, since they already own us as if we are a professional sports team? Let’s have a naming contest for the sign on our stadium. Pharmerica? United States of Amercka? Too bad our brain-damaged, immune-suppressed, chronically fatigued team will lose every game. No, vaccines are not safe. In the August 2015 issue of Pharmacy Practice news, the Infectious Diseases Society of America and Jon Temte, MD, MS, PhD, former chair of the Advisory Committee on Immunization Practices (ACIP), expressed serious concerns about legislation known as the “21st Century Cures Act” forcing rushed approvals of vaccines for widespread use. In doing so, they admitted that vaccines are not safe for our babies. No, we’re not cows, but we might as well be. Cattle have no choice, and now those who are supposed to protect public human health want to take away our choice. Choice, more so than thumbs or bipedalism, is what separates us from cattle. Choice is what has driven the U.S. pharmocracy to disable our children for profit. Yes, they have chosen profit over the sanctity of any individual, innocent life. “Corporations are People” surely is a proclamation that was meant to desensitize us to the pharmaceutical corporate crime that is being perpetrated against U.S. citizens. After all, corporations are made up of people—and we all want to believe that people are inherently good, even when they clearly are not. Choice is what makes the top cops in the country look away from the blatant evidence of neurologic injury from contaminated vaccines. The DOJ chooses to let us suffer and our children continue to be maimed. Choice is also what we the people will use to exert our scientific exemption over Nazi-style forced vaccination. 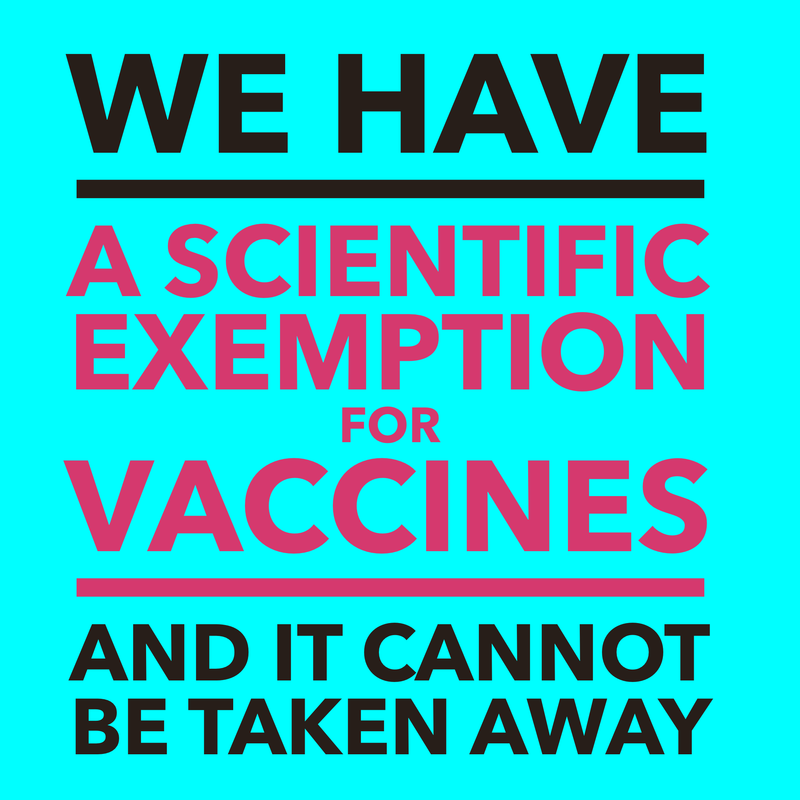 The scientific exemption, the proof that fungal contamination in vaccines causes autism, cannot be taken away from us. Do you think there would be autistic cows if they didn’t just kill them before the calves developed symptoms? Reading the original cdc blurb, the heifer received 10 times the dosage of the vaccine she should have.